The Third Edition of Preferred Stock Investing, published less than a year ago, includes all of my latest research regarding the market price behavior of high quality preferred stocks. Five new chapters and 70 additional pages use real preferred stocks to show you how to screen, buy and sell the highest quality issues. 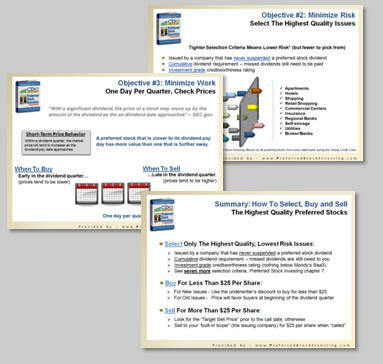 Chapter 15 lists all qualifying preferred stocks that have been issued since January 2001 and shows you how you would have done by using the investment method described throughout the book for each one. And the book includes all of the websites and other resources that are used to implement the CDx3 Income Engine on your own. Coming Up For Preferred Stock Investors: In the Next Month's Sneak Peek article at the bottom of this CDx3 Newsletter, I show you why I will be watching the Federal Reserve's efforts to withdraw the massive amounts of cash sitting in bank reserves and start increasing interest rate in order to head off inflation. The Fed should launch into its anti-inflation efforts within the next few weeks and I look forward to reporting back to you regarding how their policies affect the marketplace for the highest quality preferred stocks in next month's issue of the CDx3 Newsletter. While the economic crystal ball is never as clear as anyone would like it to be, it appears that we will not have to read (or write) about banks as much throughout 2010. For this, we can all be thankful. It is at this time of year that it is worth a quick look back at the year just completed to gain some perspective about the year that lies ahead. How did preferred stock investors do during 2009 and where is the marketplace for the highest quality preferred stocks positioned going into 2010? As explained throughout my book, Preferred Stock Investing, being a successful preferred stock investor is all about using the highest quality preferred stocks to earn above-average dividend income while positioning yourself for multiple downstream capital gain opportunities (if, at some future point, you decide to sell). The cost of money throughout the U.S. economy fluctuates over time and those fluctuations create buying and selling opportunities for preferred stock investors, at least those who have read Preferred Stock Investing, now in its third edition (look inside Preferred Stock Investing at Amazon). While tense at times, 2009 delivered the end of the Global Credit Crisis and some of the best financial results that preferred stock investors have seen in years. Those following the preferred stock investing method described throughout Preferred Stock Investing ("CDx3 Investors") have done extremely well since the crisis began in June 2007. I posted a quick summary on my blog, the Preferred Stock Investing Reader's Forum, on December 14 that tallies up the 2009 results for CDx3 Investors. There were sixteen banks that, during the Global Credit Crisis, either went bankrupt (twelve) or were acquired (four). These sixteen banks had a total of 70 preferred stock issues trading, 57 issued by the twelve banks that went bankrupt and the remaining thirteen preferred stocks issued by the four banks that were acquired. The ten CDx3 Selection Criteria from chapter 7 of Preferred Stock Investing allow preferred stock investors to select just the highest quality issues and filter out the pretenders. Regular preferred stocks that are able to meet the ten criteria are "CDx3 Preferred Stocks." The ten CDx3 Selection Criteria were first published in October 2006, eight months prior to the onset of the Global Credit Crisis (you can see a sample of three of these criteria in the sidebar at the top of this CDx3 Newsletter) and emphasize risk-reduction over other considerations. How did preferred stock investors who used the ten CDx3 Selection Criteria to help guide their investments do? You can see the results in Chart 1. The ten CDx3 Selection Criteria filtered out every single one of the 57 preferred stocks from the twelve failed banks and let pass the thirteen issues from the banks that ended up being acquired. While those holding the preferred stocks from the bankrupt banks lost their investment, CDx3 Investors did not miss any dividend payments. The CDx3 Selection Criteria, in advance, identified 70 out of 70 preferred stocks correctly - the 57 to avoid and the thirteen to consider. All CDx3 dividends were paid on time and in full. So when I say that "CDx3 Preferred Stocks" are the highest quality preferred stocks available, these results should make it very clear why I feel that way. Not only did the ten CDx3 Selection Criteria protect CDx3 Investors, these investors also knew when to make their purchases each month throughout the crisis. The "CDx3 Bargain Table" is described in chapter 10 of Preferred Stock Investing, "Buying During A Buyer's Market." As explained in that chapter, each month a sub-group of CDx3 Preferred Stocks will reach a point in time that, my research shows, will tend to favor buyers (i.e. low market prices). Just as the ten CDx3 Selection Criteria saved preferred stock investors throughout the Global Credit Crisis, the CDx3 Bargain Table identified purchase candidates at just the right time (NOTE: subscribers to the CDx3 Notification Service receive the CDx3 Bargain Table each month as part of their subscription). 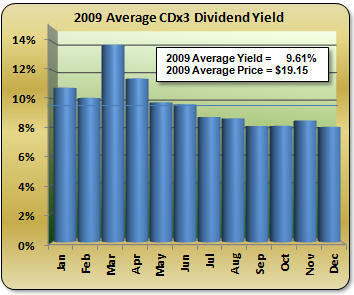 Chart 2 shows the average annual dividend yield of the CDx3 Preferred Stocks that appeared on each month's CDx3 Bargain Table throughout 2009. 9.61% Now; 15% Later ? CDx3 Preferred Stocks that were purchased using the CDx3 Bargain Table during 2009 have provided preferred stock investors with an average annual dividend yield of 9.61%. What's more is that because these preferred stock investors knew when to make their purchases, those wishing to sell downstream are also now positioned for a substantial capital gain. CDx3 Preferred Stocks that subscribers were purchasing for an average purchase price of $19.15 per share during 2009 closed December at $22.33, pushing effective annual returns (dividends plus capital gains) to about 15% for these preferred stock investors should they choose to sell. Any way you slice it, 2009 was a great year for preferred stock investors who have been following the preferred stock investing method described throughout Preferred Stock Investing. Just as banks drove the market for preferred stocks during 2009, inflation and unemployment, and the Fed's monetary policy decisions intended to manage them, will be among the big stories for 2010 (economists have recognized the short-term inverse relationship between inflation and unemployment since the 1950's; see an explanation of the "Phillips Curve" here). And as I am about to explain, the timing of those decisions, as much as the decisions themselves, will have a direct bearing on the marketplace for the highest quality preferred stocks. Just as Ben Bernanke's Federal Reserve is responsible for monetary policy (adjusting the money supply and interest rates to control inflation) our Legislature is responsible for fiscal policy (adjusting government spending and taxes to stimulate employment). If the rest of us out here in the cheap seats are lucky, the Fed's monetary policies and the Legislature's fiscal policies will be complimentary to one another, resulting in economic growth characterized by low inflation and low unemployment. On the monetary side, over the last two years hundreds of billions of dollars were pumped into bank reserves (via Treasury's TARP and other programs) and Bernanke lowered interest rates to near-zero. Money became essentially free. While both of these moves probably saved our banking system from collapse, they are extremely inflationary if left in place. Bernanke needed to keep these monetary stimuli in place long enough to save our financial system (which is now done), but not for so long that they start causing inflation. All of that cash cannot be allowed to find its way to consumers or consumers will do what consumers always do - spend it, driving prices way up. For their part, last spring the Legislature embarked on a two-step agenda for 2009 - step 1, an economic stimulus package aimed at holding unemployment below 8% followed by step 2, healthcare reform. The Big Plan was that Bernanke's monetary measures would save the banks while the Legislature's fiscal measures would strengthen the economy and bring down unemployment. That would position Bernanke, in the summer of 2009, with plenty of time to start removing the massive amounts of excess cash sitting in bank reserves and, by summer of 2010, start increasing interest rates before inflation could take off. By then businesses would be healthy enough to handle the increasing cost of money without laying off workers (which would increase unemployment thereby unraveling the gains of the Legislature's step 1). But as any general will tell you, even the best battle plans rarely withstand contact with the enemy. The economic stimulus package did nothing to slow down unemployment. The rate blew right past 8%, past 9% and by the fall of 2009 one out of every ten workers you know were no longer receiving a paycheck. Undeterred, our Legislature decided to proceed to step 2 anyway (healthcare reform), rather than return to the business of fiscal policy and spent the rest of 2009 debating healthcare while the unemployment rate settled on the far side of 10%. 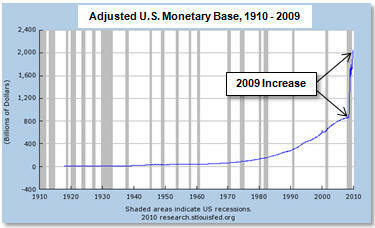 That decision last fall reduced the amount of sand left in Bernanke's inflation-avoidance hourglass by half. If Bernanke is going to keep our economy from producing what could easily be double-digit inflation (and at a time of double-digit unemployment, in very rare defiance of the Phillips Curve), he is going to have to begin raising interest rates shortly after removing the excess cash from bank reserves (which is set to begin in the next few weeks). Analysts are speculating that interest rate hikes are going to have to begin as early as this summer in order to keep inflation in check. What use to be a year to get this touchy maneuver exactly right, is now down to six months. 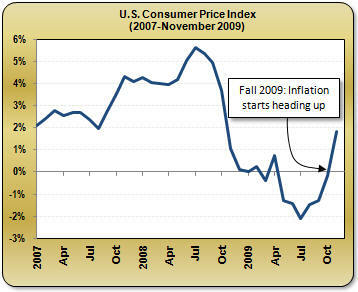 The Fed's stated inflation limit is 2%, but, as illustrated by Chart 3, it is at 1.84% already (November 2009 is the most recent data). Do investors think Bernanke will be able to pull it off? One way to answer this question is to look at the price of gold, which investors often flee to if they feel inflation is on the way. Chart 4 shows the market price of an ounce of gold throughout 2009. Notice what happened last fall. As soon as it became apparent that the Legislature was going to abandon their fiscal policy efforts in favor of debating healthcare reform, the market price of gold shot up by about 16% in the last four months of 2009 (an annualized clip of out 50%). By deciding to move on to the healthcare debate, rather than return to fiscal policy measures to deal with unemployment, the Legislature crippled Bernanke's ability to hold off inflation during mid- to late-2010 and gold investors knew it the minute it happened. As nice as this recovery has been, businesses are not yet in a position to absorb an increase in the cost of money. We probably have at least until summer before anything in that respect starts to change. The CDx3 Perfect Market Index is a proprietary metric available to subscribers to the CDx3 Notification Service on the subscriber's exclusive website (see the Special Announcement article below to take a tour). A value of 100 represents a theoretical perfect market for CDx3 Preferred Stocks; a value above 100 means that the market for the highest quality preferred stocks favors buyers, while a value less than 100 indicates a market that favors preferred stock sellers. In addition to (1) the type of market (buyer's or seller's), the CDx3 Perfect Market Index chart allows us to directly observe (2) the depth of the market (how far away we are from a perfect market), (3) the direction of the market (heading away from or closer to a perfect market) and (4) the speed with which the market for the highest quality preferred stocks is moving in that direction. 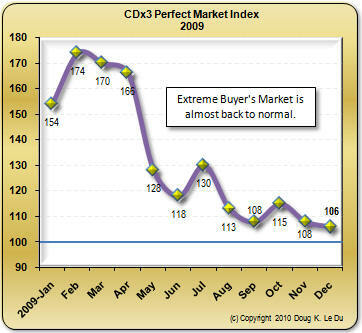 Chart 5 shows the CDx3 Perfect Market Index for 2009. As illustrated on Chart 5, the market for CDx3 Preferred Stocks favored buyers throughout 2009, but has been heading toward a "seller's market" since March as much of the excess yield caused by the Global Credit Crisis is removed by steadily increasing market prices. If Bernanke begins increasing interest rates while there is still excess yield in the market for CDx3 Preferred Stocks, corporate bond interest rates will increase but preferred stock dividend rates probably will not since those rates will still be seen as artificially high by issuers. But if the CDx3 Perfect Market Index falls below 100 (i.e. the crisis-caused excess dividend yield is pushed out of CDx3 Preferred Stocks by continued increasing market prices) before Bernanke starts to increase the cost of money, we may very well see the dividend rates being offered by newly issued CDx3 Preferred Stocks move up as well (and market prices for previously issued, lower dividend payers move down per the Rule of Rate/Price Opposition from Preferred Stock Investing, page 52). Come summer, the timing of Bernanke's move to increase interest rates will take center stage. If the crisis-caused excess dividend yield still exists within the marketplace for high quality preferred stocks (i.e. the CDx3 Perfect Market Index is still greater than 100), there should be little short-term affect on preferred stock dividend rates. Otherwise, watch for new preferred stock dividend rates to move up along with corporate bond rates and treasury rates. For those interested in realizing a capital gain, such a move could create selling opportunities for your holdings of previously issued, lower-paying preferred stocks. Either way, those choosing not to sell will just keep cashing the great quarterly dividend checks that come with CDx3 Preferred Stocks regardless of monetary and fiscal policy as we have just demonstrated during the last two years of the most extreme conditions (see Chart 2 above). As we start a new year, position yourself for the upcoming opportunities that the highest quality preferred stocks can offer. Invest in the best. We do the research and calculations, you make the decisions. Please consider subscribing to the CDx3 Notification Service today (and don't forget to take the tour of the new subscriber's website by clicking on the link in the following Special Announcement article). 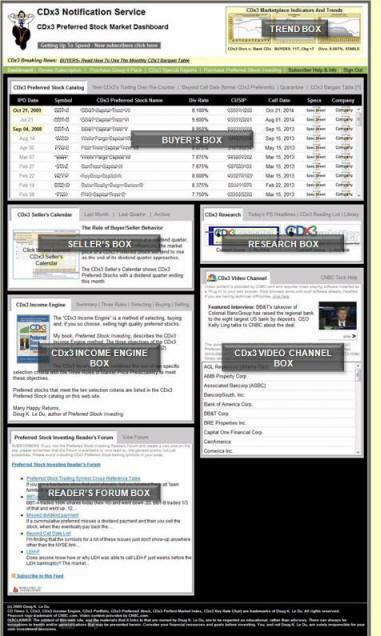 Subscriber's to the CDx3 Notification Service (my preferred stock research and email alert service) received a great Christmas present on December 20, 2009. Version 3.0 of the subscriber's website provides subscribers with the most comprehensive resource available for preferred stock investors. Preferred stock research is very hard to come by. The service is intended for individual investors as well as groups (investing clubs, brokers, families or groups of friends) and all information is provided in plain English for non-experts. If you want to get serious about your preferred stock investments, maybe it's time for you to subscribe to the CDx3 Notification Service too. Hospitality Properties Trust is a $2.9 billion Real Estate Investment Trust (REIT) founded in 1995 and headquartered in Newton, Massachusetts. HPT owns 289 hotels and 185 travel centers located throughout the United States, Ontario, Canada and Puerto Rico. HPT's hotels are operated by some of the largest and most experienced hotel management companies in the world, including Marriott International, InterContinental Hotels, Hyatt Corporation and Carlson Hotels Worldwide. Its travel centers are operated by TravelCenters of America LLC. During economic slowdowns the tourism business can take on all of the stability of a Hollywood marriage, although the weak U.S. dollar has encourage increased travel by foreign visitors. Occupancy rates are down as are room rates. If you are a common stock investor looking for a quick value spike, the hotel business is unlikely to provide it to you. But for preferred stock investors the picture is considerably different, especially since HPT is classified as a REIT. REITs are required to distribute 90% of their profits to shareholders. REITs comply with this requirement by paying out dividends on their common stock and preferred stock to shareholders. In lean times, when profits get squeezed, common stock dividends are the first to go; the REIT will seek to comply with the 90% distribution requirement through preferred stock dividends. HPT has been using the Global Credit Crisis and resulting slowdown to sell off underperforming assets as well as do some bargain hunting of its own. During 2007 HPT sold Homestead Studio Suites (2,399 hotel rooms) for $1.9 billion, realizing a $95 million gain over its 1999 purchase of this chain, and acquired TravelCenters of America. Then in 2008 HPT acquired 40 hospitality and fuel centers from Petro Stopping Centers for $630 million. The sites are located in 25 states and provide $62 million in annual rents to HPT. "Hotel REITs are another focus for me right now. Distressed-investing legend Sam Zell has said that that is going to be his initial focus in the commercial space, and I believe he is correct in his approach. Hotels are selling well below replacement cost right now. Almost all of the hotel REITS sell below tangible book and at a fraction of replacement cost. Companies that I like in this sector include Diamond Rock and Hospitality Property Trust, and I intend to build a decent position in the hotels in 2010. In addition to distressed buyers, a weak dollar should entice significant interest among foreign investors for premier hotel properties next year." In a January 2, 2010 Stock Report, Standard & Poor's says: "HPT maintains one of the most conservative balance sheets within the lodging REIT industry, in our opinion. As of December 31, 2008, HPT had a debt to equity ratio of 1.03X, below the peer average of over 1.49X, and did not violate any of its debt covenants. In addition, HPT has a minimal amount of debt maturities until 2011. We believe that balance sheet management helps mitigate some of HPT's risk in the current market." The S&P report provides a Technical Evaluation of HPT as "Bullish." A specific preferred stock from HPT trades under the symbol HPT-B. HPT-B is a former CDx3 Preferred Stock but has since exceeded its call date. Preferred stocks that have exceeded their call date can be "called" by the issuing company at any time (when a company "calls" a preferred stock, they purchase your shares back from you at $25.00 per share and the issue ceases trading; CDx3 Preferred Stocks reach their call date five years after their introduction). As you might guess, once The Market believes that conditions favor a call of a preferred stock, the market price of such a preferred stock will gravitate toward $25 per share. This chart shows the market price of HPT-B over the last two months. Until a couple of weeks ago HPT-B had not traded at or above $25.00 per share since December 17, 2007. I featured HPT-B in the July, 2009 issue of the CDx3 Newsletter as the subject of the CDx3 Question of the Month. At the time that I gave you a heads-up HPT-B was trading for $19.00 per share. The question that I posed last July was "which preferred stock is most likely to be called?" Of the choices given, the answer was HPT-B. HPT-B reached its call date on December 6, 2002 and pays a fixed 8.875% annual dividend. HPT has not only weathered the economic slowdown better than many, but has used the opportunity to make acquisitions, positioning itself for future growth. And it happens to be the issuing company of one of the most interesting former CDx3 Preferred Stocks. You can see recent upgrade/downgrade activity for HPT by clicking here. To see if your favorite hotel is owned by HPT, click here. 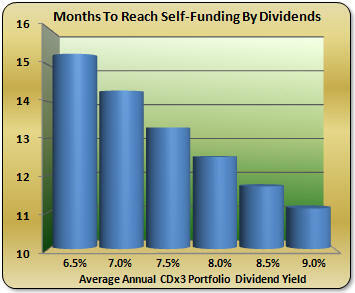 How many months does it take a CDx3 Preferred Stock portfolio with an average annual dividend return of 8% to reach the point of "self-funding?" - Preferred Stock Investing Reader's Forum. We've all experienced the miracle of compound interest. With a bank CD, your bank pays interest into your CD account every month then, the next month, you earn interest not only on the principal amount that you used to open the CD, but you also earn interest on those previous interest payments. Your interest starts earning interest. CDx3 Preferred Stock portfolios benefit from this compounding mechanism as well, but in a slightly different way. As your portfolio generates dividend income those dividends start piling up in your brokerage cash account. At some point, depending on the average annual dividend yield that your portfolio pays, you will accumulate enough dividend cash to buy your next CDx3 Preferred Stock without any "new" money from you (in rough numbers, CDx3 Preferred Stock shares generally cost about $25 each). Using accumulated dividend cash to make your next CDx3 Preferred Stock purchase allows a preferred stock investor to realize the miracle of compounding. The CDx3 Preferred Stock that you purchased with accumulated dividends starts generating dividend cash of its own, so you start earning dividend income on your dividend income. The length of time that it takes for your preferred stock portfolio to reach this point of "self-funding" depends on (1) the average dividend yield of your preferred stocks and (2) the number of preferred stocks you have in your portfolio. The higher the average yield of your holdings and/or the more shares you own, the sooner your portfolio will become self-funding. Let's assume that you purchase one share of CDx3 Preferred Stock each month. If your twelve-share preferred stock portfolio earns an average annual dividend return of 8.0%, how many months will it take for your portfolio to reach this magical point of "self-funding" where it is generating enough cash to purchase the next preferred stock on its own without any new money from you? The answer is (A). A new CDx3 Preferred Stock share costs about $25 so the real question becomes "how long does it take my 8% portfolio of twelve CDx3 Preferred Stock shares to generate $25?" One of the many great things about CDx3 Preferred Stock investing is that the dividend payments that you receive each quarter are for a fixed amount; it does not matter what the current market price is nor does it matter what you originally paid. CDx3 Preferred Stock dividends are based on the number of shares you own and are not affected by fluctuations in their market price. So when the issuing company calculates your quarterly dividend, they multiply the declared annual dividend rate (8% in this case) times $25.00 regardless of the then-current market price or your purchase price. An 8% CDx3 Preferred Stock is going to pay you $2.00 per year in dividend income (8% times $25.00) for every share that you own. If you have twelve CDx3 Preferred Stock shares in your portfolio, you will receive $2.00 for each share for a total of $24 per year or a total of $2.00 per month. Generating the needed $25 will therefore take 12.5 months ($25 divided by $2 per month). My use of 8% for this example was not an accident. 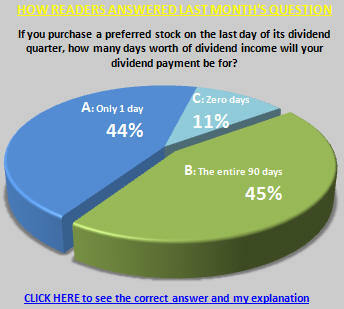 If you look at Chart 2 at the top of the above Last Month's CDx3 Investor Results article you will notice that the average annual dividend yield being paid by CDx3 Preferred Stocks right now is 8%. That means that in a little over a year from now you could have a portfolio of CDx3 Preferred Stocks that is generating enough dividend income to buy the next one on its own without any new money from you. 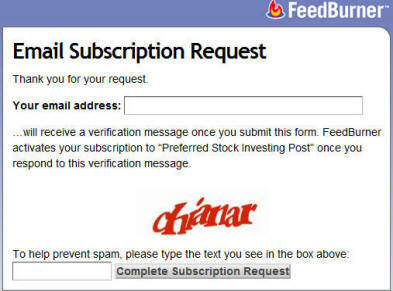 Subscriber's to the CDx3 Notification Service receive email messages when there are buying and selling opportunities coming up for CDx3 Preferred Stocks. We do the research, you make the decisions. Please consider subscribing to the CDx3 Notification Service today and start building your "self-funding" CDx3 Portfolio. As the real estate bubble burst in late-2006 and the economy worsened throughout 2007 and 2008, mortgage loan default rates steadily increased. The cash reserves that banks must keep on hand are pegged to that default rate; an increase in the loan default rate means that lenders are required to keep more cash on hand in order to cover their losses. The reverse is also true. As the economy improves and default rates slow up, lenders are not required to keep as much cash in the back room. Normally, that cash would find its way into new loans and, ultimately, end up in the hands of businesses and consumers who would then spend it, further fueling a recovery. But there was nothing normal about the massive volume of loan defaults that has occurred over the last couple of years, well beyond most bank's ability to meet their increasing cash reserve requirements on their own. The U.S. Treasury consequently pumped hundreds of billions of dollars into banks to help shore up reserves, increasing the amount of cash in the economy (see chart; read more here). Note the unbelievable spike in 2009. Classic economic theory supports the notion that increasing the money supply will also increase inflation (more cash available means more consumption which, in turn, causes an increase in prices). But recent research also suggests that the inflationary effect of an increase in the supply of cash depends on where that cash is located. As long as it is just sitting in bank reserves, no problem. But as loan default rates improve and bank reserve requirements lighten up accordingly, can we count on banks not to start loaning out this pile of cash? The Federal Reserve recently floated a proposal to bank officials that suggests methods for soaking up all of that cash in some mannerly fashion and getting it back out of bank reserves as the economy continues its recovery. I will be watching this effort very carefully since, as I explained in the Last Month's CDx3 Investor Results article above, the timing of the Fed's ability to remove this excess cash then begin increasing interest rates has a direct influence on the marketplace for CDx3 Preferred Stocks.